A very special new year: 2019 is our 20th! In 1999, a small group of farmers and farm advocates planted the seed of an idea: farmland matters, and should be protected. Word spread, meetings were held with like minds, and soon, MFT began as the first and only land trust in the state focused on protecting farmland and supporting farmers. Thanks to the pioneering vision of our founders, the hard work of volunteers and staff, and the support of members, that seed took root and grew! This year, we’ll celebrate 20 years of growing the future for farming by reflecting on our milestones over the years, acknowledging the many people who have helped shape MFT, and by looking ahead to the next chapter. We’ll share stories of farmers and members, host some really fun events, organize a listening tour, and more. Most importantly, we want to create opportunities for you to be involved in shaping the next 20 years and beyond. Together, we can have a lasting and positive impact on the future for farming in Maine. Visit our anniversary website to keep up on all things 20th, and stay tuned for details about happenings. Be sure to join us for our Kick Off Party in Belfast on January 24th! Belfast. 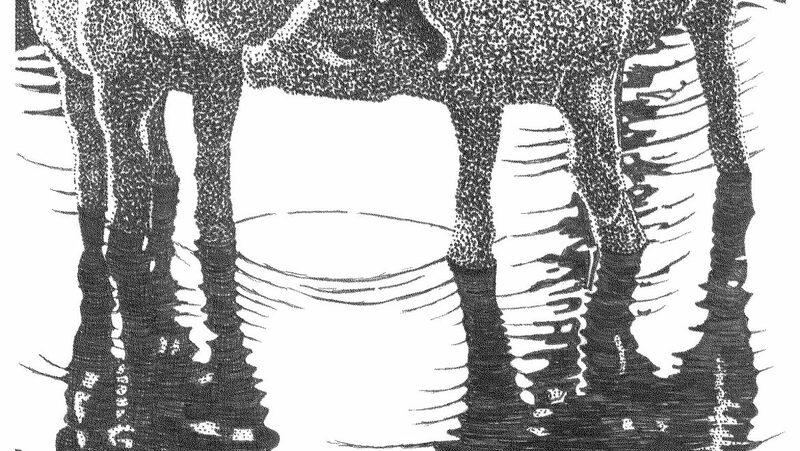 Maine Farmland Trust Gallery’s annual Summer Stable Show is a favorite with returning art-lovers and summer visitors alike. 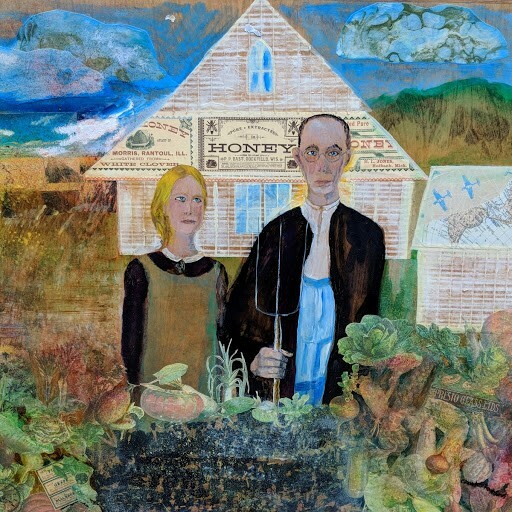 The gallery’s largest, most vibrant group show, showcases twenty-two Maine artists this year, whose work connects to agriculture, nature or environment, including first time exhibitors Sara Gagan and Susan Sidwell. The first floor of the gallery features a large, dynamic, abstract mixed-media piece from a series on rhythms in nature, by Belfast’s Kathryn Shagas; beautiful bright photographs of local landscapes printed on aluminum by Sarah Szwajkos; and a colorful collection of small paintings entitled “Artifacts” by Portland’s Christopher O’Connor. Contemplative figurative works by sculptor Elizabeth Ostrander create a synergy with the beautiful large goddess image “Oracle,” an intricate scherenschnitt paper cut created by MJ Viano Crowe. 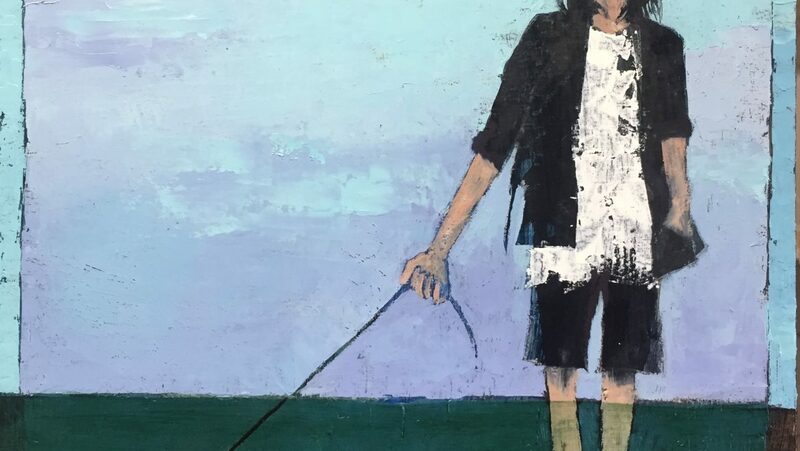 The evocative paintings of Sheep Jones, another Belfast artist, contribute strong color, content, and design in her series of “Bulb Narrative” and “Fish Walker.” Sara Gagan’s images of animals are a delightful and inventive use of oils and collage elements. John Arden Knight’s large acrylic paintings of water lilies and milkweed are bold and vibrant, while Leslie Harris and Leslie Anderson present wonderful atmospheric paintings of landscapes and figures. Jude Valentine’s series of small brilliant pastels depict the many views and moods from Great Cranberry Island to Acadia. 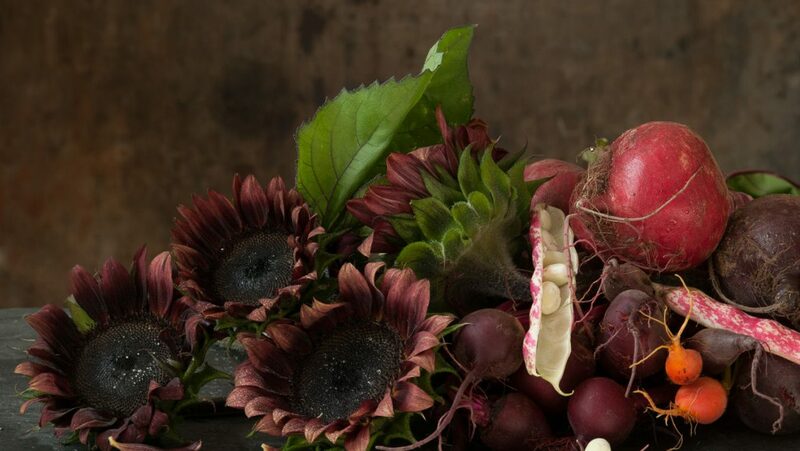 Paintings by Leslie Bowman, Julie Cyr, and Sharon Yates round out this collection with such varied natural subject matter as a charming chick, engaging peas in a pod, and rich tulip still lifes. 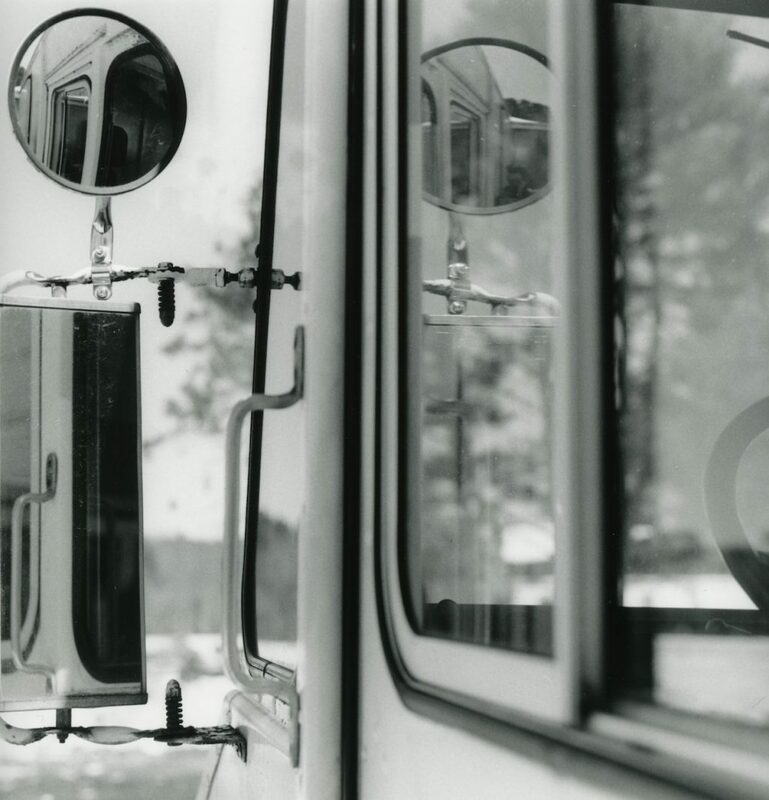 The second floor displays the photographs of Terry Hire, Lynn Karlin, and Jim Nyce, all with very different mood, use of color, and subject matter. Lou Schellenberg impresses with oil paintings of strong, imposing landscapes and sky with vigorous compositions. DiTa Ondek’s paintings of laundry fluttering on a clothesline in the wind create a colorful sense of energetic movement, while Kathleen Perelka’s lovely use of light and color accentuate a cultivated farm landscape. 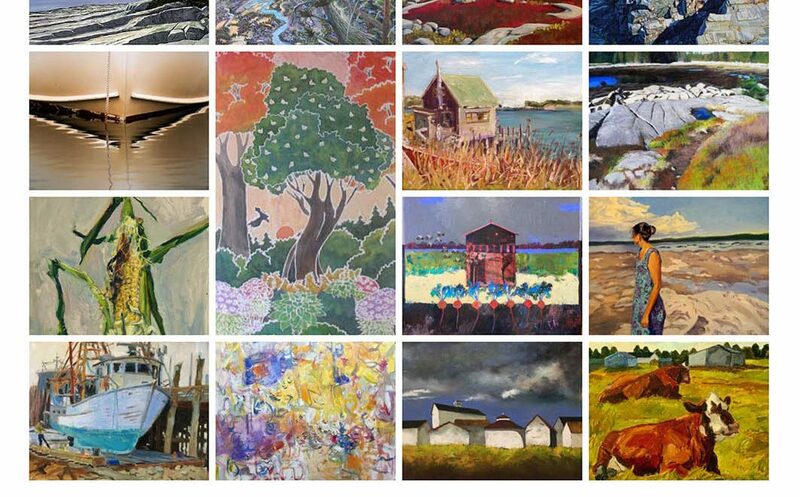 Robin Rier’s oil paintings incorporate vivid colors in tranquil scenes of flowers, peeling paint and old fence posts. The bug and rosehip mandala paper cut prints of Susan Sidwell draw you in for a closer look with their intricate design work. 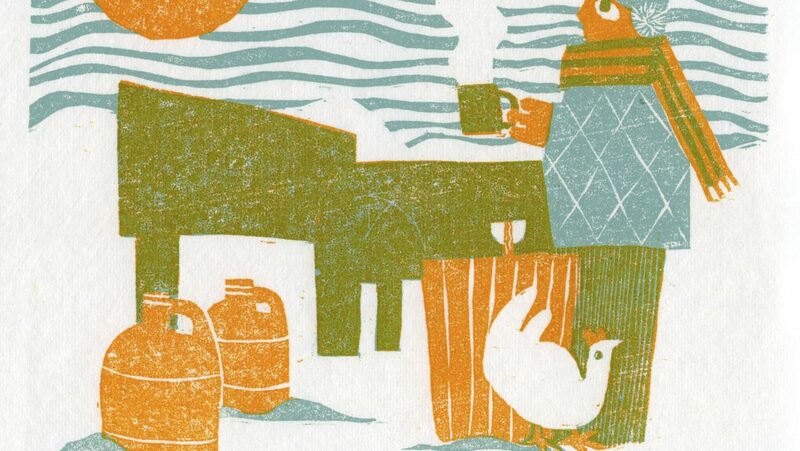 The Summer Stable Show 2018 runs from June 4th through August 31st, with artist talks Friday July 27th at 5 pm, followed by a reception and the town-wide Belfast Art Walk from 5:30-8 pm. 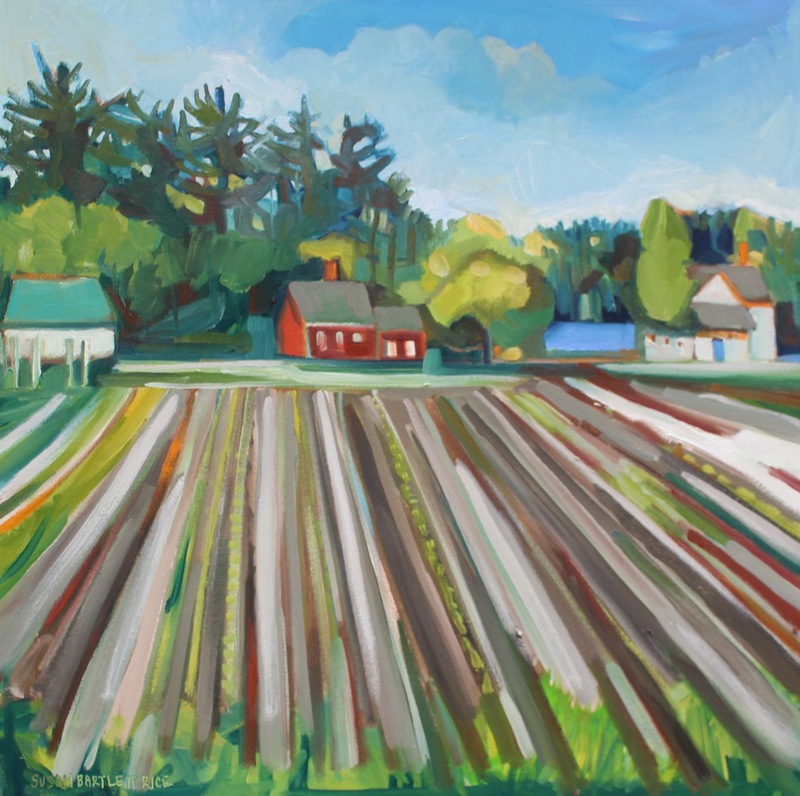 Maine Farmland Trust Gallery, located at 97 Main Street, Belfast, is open Monday through Friday from 9am-4pm, and Saturdays 10am -2pm through the summer. More information can be found at www.mainefarmlandtrustgallery.org. 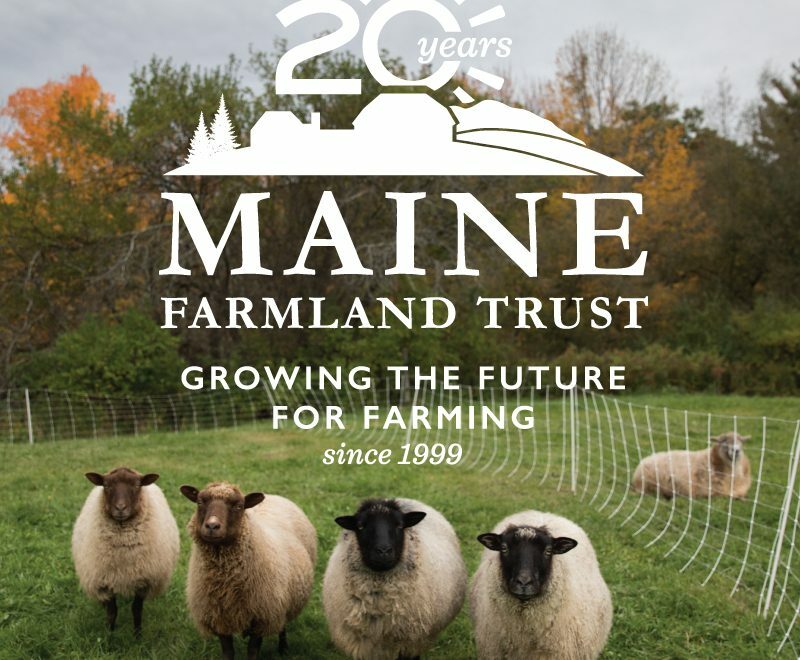 Maine Farmland Trust is a statewide, member-powered nonprofit working to protect farmland, support farmers, and advance farming. 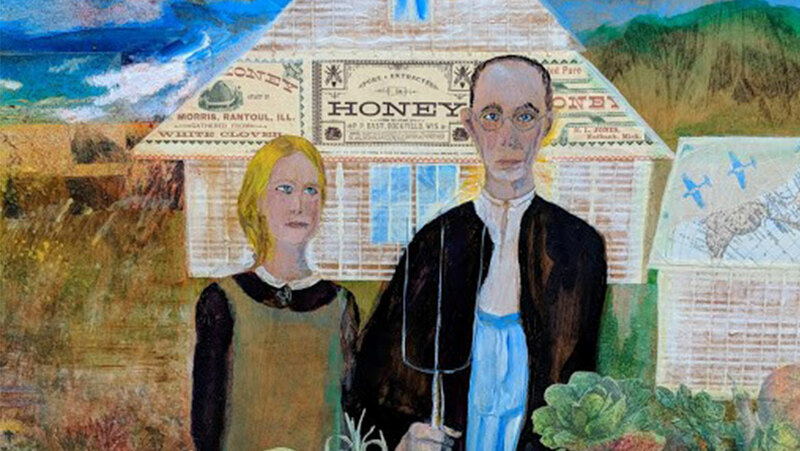 Maine Farmland Trust created its gallery to celebrate agriculture through art, and to inspire and inform the public about farming in Maine. For more information on the Trust visit www.mainefarmlandtrust.org. 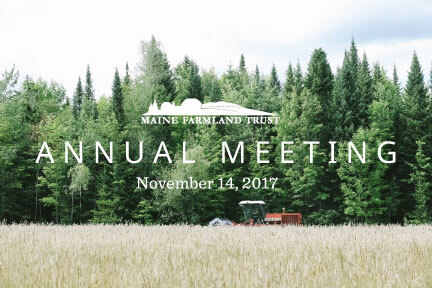 Join us at the United Farmers Market Building in Belfast on Tuesday, November 14th, 5:30-8:00pm, for a fun evening to celebrate MFT’s work in 2017, and to learn about the growing Maine grain economy. Rob Tod, Allagash Brewing Co.
+ taste beers made with Maine grains! Maine Farmland Trust Gallery, in partnership with the Harlow Gallery/Kennebec Valley Art Association, presents CSA II – one of three exhibitions of work by 13 Maine artists who have been partnered with CSA (Community Supported Agriculture) farms throughout the 2017 growing season. Participating artists and farms are: Ingrid Ellison of Camden (paired with Hope’s Edge Farm), Helene Farrar of Manchester (paired with Farmer Kev’s), Dylan Gifford of Kents Hill (paired with Wholesome Holmstead), Karen Merritt of Portland (paired with Crystal Spring Farm), Anna O’Sullivan of Portland (paired with The FarmME), Tim Ouillette of Portland (paired with Hancock Family Farm), Tyson Pease of Gardiner (paired with Tender Soles Farm), Alyssa Phanitdasack of Portland (paired with Sheepscot General Farm and Store), Jessica Rhoades of Thomaston (paired with Whatley Farm), Susan Bartlett Rice of Walpole (paired with Tarbox Farm), Nicholas Runco of Oakland (paired with KVCC CSA), Kris Sader of Orono (paired with Ripley Farm), and Rebecca May Verrill of Portland (paired with Frith Farm). During CSA II (Community Supporting Arts), participating artists have been visiting their partner farms regularly since January 2017, at the very start of this year’s growing season, creating art inspired by their farmers’ lives, work, and landscape. 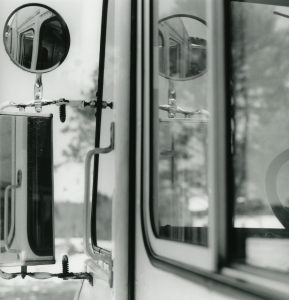 The resulting body of artwork will be exhibited at three venues in the fall of 2017: at the Maine Farmland Trust Gallery in Belfast September 22 – November 10; at the Harlow Gallery in Hallowell October 27 – December 2; and at Engine in Biddeford November 10 – December 16. 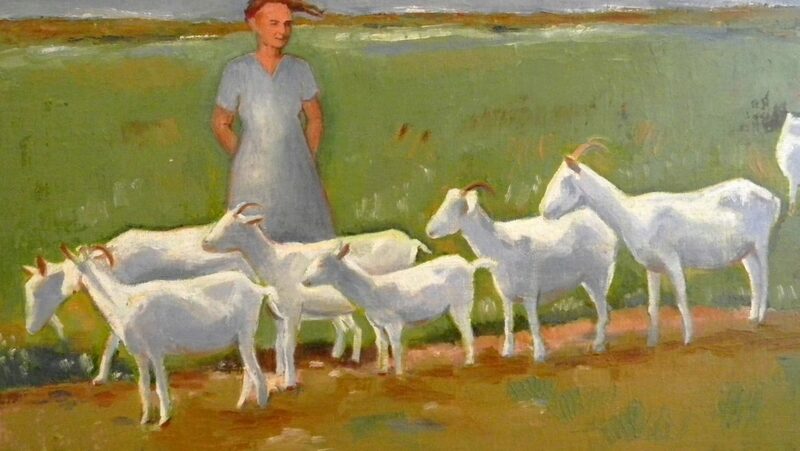 Maine Farmland Trust Gallery, located at 97 Main Street, Belfast, is open Monday through Friday from 9am-4pm. 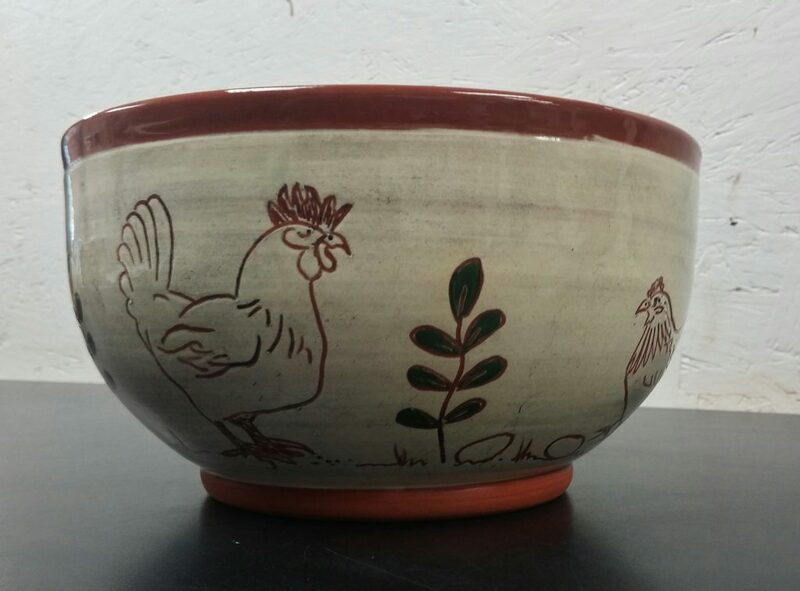 More information can be found at www.mainefarmlandtrustgallery.org. Summer Stable Show 2017 Land and Sea on display July 3rd-September 15th. Artist Talks Friday July 28th at 5pm followed by reception 5:30-8pm during Belfast Fourth Friday Art Walk.